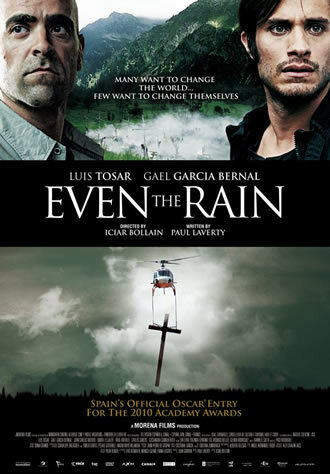 The title of this powerful film relates to the on-going theft of all Bolivia’s natural resources, from the time of the first Spanish invasion under Christopher Columbus to the recent attempts to privatise the water supply, denying the rights of the indigenous people. These two time frames are brought together through the use of a film crew visiting Bolivia to record the initial encounter between the two cultures and some of the shocking examples of unequal power being used to humiliate the South American-Indians; and the Bolivian ‘extras’ from the film becoming actively involved in the struggle to resist the corporation that sought to steal the rain’s gift of water that is essential to life. The assumption of ‘Indians’ being ‘a soft touch’ who will do anything you ask them, especially if bribed, is challenged by the key character with his distinctive features and face painting. His daughter, however, succumbs to the flattery of the director for her acting in a scene depicting the mutilation of an ‘Indian’ who has not collected enough gold-dust; but later she joins her father in the water privatisation protests. The main characters are the director of the film and the very rebellious ‘extra’ , who move from extreme antagonism at the start and most of the way through, but end up close as the common humanity surfaces through the injury of the actor’s daughter in the water war. Another challenging character is that of a Spanish priest who ‘spoke truth to power’ about the injustice of the way they were treating the people whose country they had invaded as being uncivilised as well as unchristian. The film shows shocking images of mass crucifixion of native Bolivians accused of ‘witchcraft’ because they will not submit to conversion to Christianity as it is used to justify the claims of the king of Spain to their land; and of women forced by the soldiers to drown their babies. This scene inspires mass resistance among the women ‘extras’, who refuse to even pretend to do this. As the film progresses, the increasing numbers of indigenous actors participating in the water war, undermines the director’s ability, despite his determination, to finish filming the early history of colonialism in South America. Screen-writer, Paul Laverty, who has collaborated with Ken Loach on many films including The Wind that Shakes the Barley, Looking for Eric and The Angels' Share, said that he wanted to emphasise the new possibilities created by people joining together to resist and sometimes to win. Mexican actor and campaigner for indigenous peoples Gael García Bernal takes on the complex role of Sebastian, the film director caught in the crossfire of conflicting loyalties. The film is set in the Bolivian town of Cochabamba, scene of real-life struggles over water privatisation, and more recently, host to the first World People's Conference on Climate Change and the Rights of Mother Earth.